Show your love with these sinfully delicious Belgian chocolate-dipped Oreo® cookies. 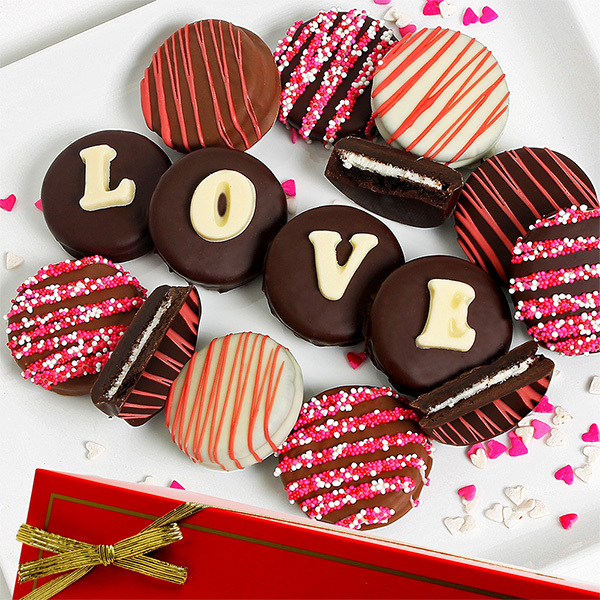 A dozen cookies are covered in rich milk, dark, and white Belgian chocolates and then decorated with white chocolate letters to spell out "LOVE". Whether you're looking for a gift for Valentine's Day, a wedding present, anniversary gift, or a gift to show someone just how much you care, there's no better or sweeter way to do it than with these cookies! I had Oreos delivered to my girlfriend for our first anniversary and they were timely and perfect! She absolutely loved them!!! I sent the oreo basket to my husband for Valentine's day and it was a big hit. It's a perfect basket for a guy! I bought this item as a gift for Valentine's Day and it tasted great.